After a terrific buffet breakfast at the hotel, Freedom picked us up at 8:45 and drove us to the airport, where we waited in the comfortable and somewhat funky Federal Airlines lounge to catch our hour and a half charter flight to Sabi Sabi Bush Lodge. Zoe has overcome a challenge this morning–swallowing a pill. Turns out that all the medication she’d taken in her almost thirteen years had been chewable, or liquid. Yesterday she’d been unable to swallow the malaria pill and wound up dissolving it in water. This morning, she tried again and, after many false starts and extensive coaching from Carol and me, she succeeded. I think the key to her success was my leaving to go down to the lobby. I’m not what one would call a patient or calm pill swallowing coach. But I do have other redeeming (to my mind) characteristics. I think Zoe would have a more limited view of my redeeming characteristics. For example, when I told her that the excellent buffet breakfast this morning was, “God’s buffet,” she just rolled her eyes. I get a rather similar reaction to my frequent questions about whether she’s enjoying the trip (on which nothing really has happened). Still, Zoe’s reaction all comes with a hidden smirk and is done in a playful manner. There are about 20 people on our small plane. The passengers include a group of thirteen from near Mumbai, India, three men, who are close friends, their wives and children, who travel together every year. Reminds me of our close Brandeis friends. I enjoy flying this way, as, unlike on large aircraft, you have a real sense of flight. We were taken from the airport to the lodge, about a half an hour drive, arriving at 1PM. We got our first taste of animals en route. 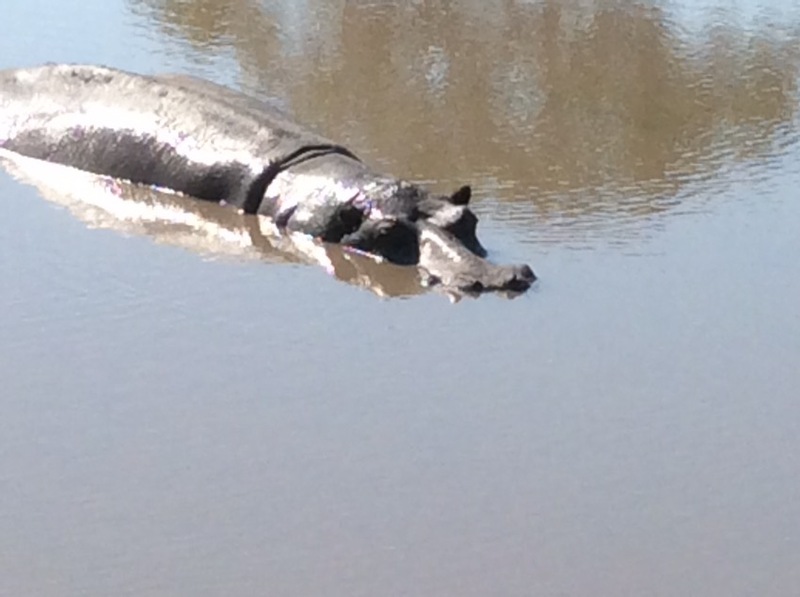 Here’s a hippo. Sabi Sabi is dedicated to the need to conserve rapidly dwindling wilderness areas and to provide a sanctuary for fauna and flora as part of South Africa’s heritage. They believe that their business must be a true example of eco-tourism effectively linking tourism with conservation and the community. Sabi Sabi’s environmental management system is a holistic one, balancing the ecological needs with the needs of people and their communities, i.e. focusing on the interdependence of tourism, conservation and local communities. Each of the 25 spacious, air-conditioned thatched suites is beautifully appointed, featuring exquisite ethnic décor in keeping with the bushveld environment. The en-suite bathrooms feature al-fresco as well as glass-fronted indoor showers, affording wonderful views. Huge viewing decks are a great setting to relax while spotting game, birdwatching, or cooling off in the pools. Meals, including the wonderful dinners in the open air boma, are heralded by blasts on a kudu horn, a summoning to delicious food. This lodge also features artistically designed open courtyards with spectacular wooden carvings by renowned South African sculptors, created from uprooted trees and wood salvaged from the surrounding bush. In short, not too shabby. After lunch outside at the lodge, we returned to our great suite to rest and prepare for the afternoon game drive with our guide, Gus, and spotter, Jack. We have four others in our large jeep (which was a bit disappointing), two women from Australia, Sue and Heather, and a couple from St Augustine, FL, Jill and Bob. All of them seem amiable, so the group will work out fine. We had several outstanding sightings on the drive: a pack of wild dogs (rarely seen, and Carol and I have never seen them on any of our trips), a large group of water buffalo that we got very close to and a leopard that had killed an impala, put it up in the tree so that other animals would not get it and climbed the tree to eat it’s kill. We also spotted a number of beautiful and interesting birds. Our drive was interrupted for half an hour for sundown drinks at sunset. On returning to the lodge, we went to the extensive outdoor buffet, eating with Gus and the others from our group. Food was quite fine, not great. On returning to the room and trying to download my photos from my camera, I discovered that I’d failed to take a wire and plug that I need to do that. Needless to say, that was VERY disappointing. Unless I’m able to get that plug three days from now in Cape Town, the only photos I’ll be able to include in this blog will be photos I take on my iPad. Damn! I’ll close this post with the advice our friend in Turkey sent this morning, “Enjoy yourselves. Life is short, delinquent, full of surprises, naughty, nutty, breathtakingly beautiful and deserving of our full attention! Go forth and attend!” We plan to do just that. Amazing. Hope you can get hooked up in Cape Town! Love reading your blogs every morning. Enjoy! Seeing wild dogs is soooo lucky! I love the airplane photo. Flying on those little planes always makes me imagine I’m in another time long ago. So much more connected to the journey. Have a fabulous trip! Already sounds amazing! I understand your disappointment about the wire, Arnie, ardent and GREAT photographer that you are though I know you’re taking it in stride. Sooo glad that pill finally went down. Credit to Carol I’m sure. P.S. We’re having a ball. I love the picture of the hippo! 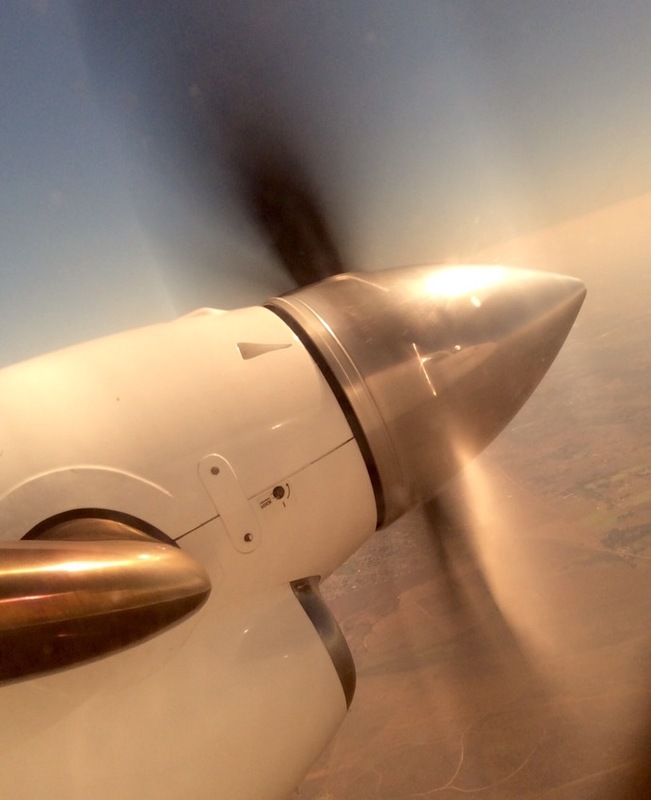 The propeller of the plane is pretty cool! thanks for the postings! hope you hook up the camera gear when in Cape Town. Any unusual foods in those buffets? And you do realize, of course, that you are missing the best Cubs start in years?